At the marina, on the lake, or out at sea, Signarama custom boat lettering is a fantastic way to distinguish your craft from the rest of the flotilla. Using the highest quality materials, we can customize your boat or personal watercraft to turn heads. Signarama precision graphics and lettering makes for easy labeling of your boat with required registration information and boat ID numbers. No size too large or small, our graphic experts routinely decorate from weekend water-ski boats to fleet and commercial vessels. From stylish names and striping to elaborate wraps, Signarama is very prepared to handle your boat lettering needs. Unlike traditional painted lettering, if your needs change, we can easily remove and replace custom boat lettering. 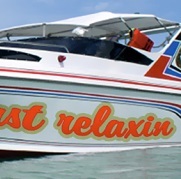 Signarama makes boat lettering and boat customization easy! Contact Signarama of Huntington for the best custom boat lettering and graphics anywhere.